In this review we are going to look into a binary options scam that you can find under different names: Doubler App, Doubler Bot or Account DoublingApp. It is presented by James Alexander. Alexander promises that you will either double your account with his app or he will pay you $10,000 in cash from his own pocket. 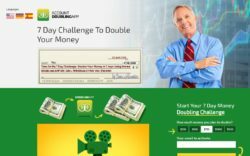 The Doubler App can allegedly double your account because it trades binary options. The software is supposedly based on an unknown loophole and you can get it for free. Whether it is called Account Doubling App, Doubler Bot or Doubler App, it is just a binary options scam. Its only purpose is to make you open a trading account with their partner broker and deposit money into it. Because it will earn these scammers an affiliate commission. Trading your account with the Doubler App will lead to losses and you won’t see a single cent from Alexander. Now let’s show you some proof. Look at James Alexander, the alleged creator of this software. He does not exist, scammers used a stock photo and made up the whole story. 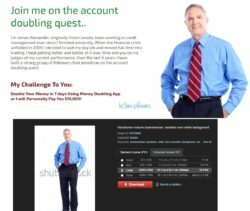 We had a look at the Account Doubling App and we immediately recognized the most used software by binary options scammers. Look at the picture on the right, it is the same app as used by scams like Trade Forecast or Option Sniper. Only the logo and colours change. Account Doubling App is an ordinary scam that is abusing binary options, so stay away from it. If you want to try binary options without risking your money, get a free demo account. There you’ll be able to try trading so that you can see how real money is made on binary options.